Fungus is an organism that thrives in warm, dark, moist areas. Toenail fungus while more prevalent in older individuals, it can affect people of all ages. 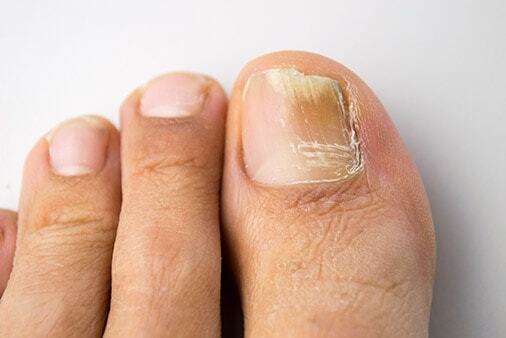 Fungus infection of the toenail is called onychomycosis and of the skin on the feet is tinea pedis or athlete’s foot. Onychomycosis often appears as a yellow, brown, or black discoloration of the toenails which may also cause thickening and deformity of the toenails. Treatment of onychomycosis by a Podiatric Physician will include the debridement and mechanical reduction of the thickened fungal toenails. This reduces the thickness of the nails which provides symptomatic relief and reduces the total fungal load. Oral antifungal medication-These medications treat the infection from the inside out. The most common medications used are Terbinafine (Lamisil) and Iitraconazole (Sporanox). These medicines are often taken for 12 weeks and uninfected nail growth will slowly grow out replacing the fungus toenails. This therapy can also be combined with topical therapy and the end results won’t show for four months or longer. Medicated nail polish- Ciclopirox (Penlac) is a prescription medicated nail polish you apply daily to the affected area. Once a week the layer of built up lacquer is removed with alcohol. Result can take up to a year or longer. Medicated Cream-Antifungal cream can be applied on, around, and under the affected toenails. Thinning of the nails allows better penetration and reduces the amount of fungus (fungal load). Medicated Foot Baths- Special compounded medical foot soaks may be prescribed which offer combinations of antifungal and antibacterial solution to help fight fungal infections.